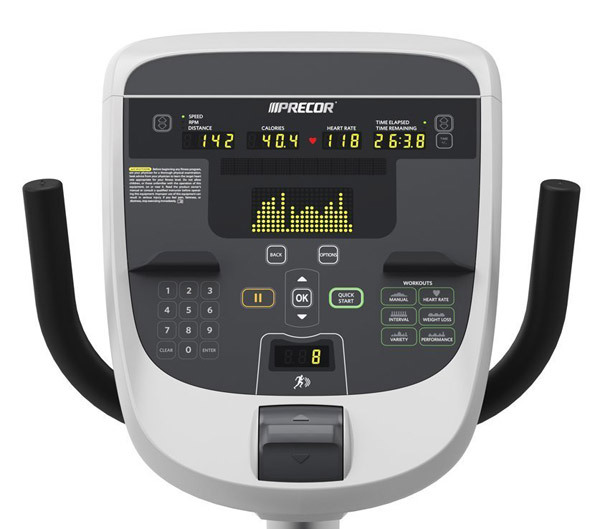 Best Rated Precor Commercial Exercise Bikes * Comparison & Reviews (2018-2019) This is a roundup of the best rated upright and recumbent Precor exercise bikes for Home or Commercial use. Precor is one of the most recognized brands of exercise equipment used in commercial settings and gyms. They are known for their reliability. These Precor commercial bikes are exactly the same models as those that you see at your local gym. All of these precor bikes are Self Powered which means you don’t need to plug them in, as they have their own generator. The 815 Series Console, and the 835 Series Console use bright LED displays. Exercise bikes provide an excellent form of aerobic exercise at home that you can do no matter what the weather is outside. Exercise bikes are easier on your joints with less impact than other forms of cardio exercise, such as running. 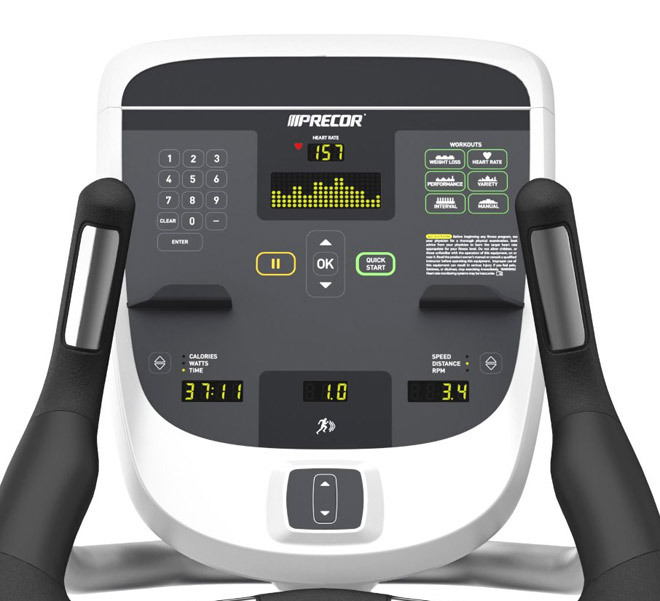 You can compare these Precor commercial exercise bikes below by features such as workout programs, reviews, maximum weight capacity, price, and other features. A glossary of terms is available at the bottom of this page. Self Powered = Precor’s commercial bikes are self powered, which means that no external electricity is required to power the electronics and display. Maximum User Weight = Each exercise bike, depending on its construction has a maximum user weight limit. More expensive bikes generally can handle more weight. So if the limit is 300 lbs, and you are over 300 lbs., you should not buy this exercise bike, but look for one with a higher weight limit. If you weigh substantially less than the weight limit, this will put less strain on the machine and parts. Heart Monitor = Most elliptical trainers have a heart grip monitor which allows you to monitor your heart rate to meet heart rate goals for cardiovascular fitness. Grip monitors are built into the handlebars. Workout Programs = Almost all exercise bikes have a small computer and display where you can run multiple workout programs that vary the resistance. However, most indoor cycle type bikes do not have workout programs. Commercial Bike = These type of bikes are built to the upmost quality, and have to survive being used all day long at gyms. Reliability is excellent. These bikes are designed to last a long time.